Who would have ever thought that a simple, no cost project that I did a year ago, would have such staying power. A great website called AllFreeHolidayCrafts.com is Featuring it for the upcoming Holiday, this year. Please be sure to go check it out, along with all the other Great Ideas!! I LOVE this! I didn't see a tutorial though, and I would love to figure out the dimensions of the strips on this one. I would love to make one just like it. 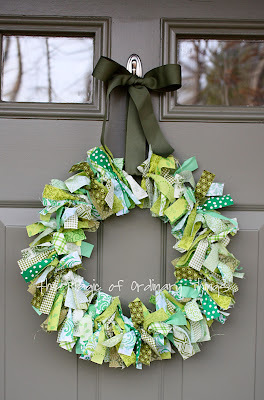 I am going to feature this wreath in my weekly links list tomorrow! I linked this post to my blog post today. Check it out! Thanks for sharing your creativity. Have a great day! Hello! I love this and made one similar to display during March of this year. I had a friend asked if she could pay me to make her one. I wondered if you would be okay with my using your idea in that way. Thanks in advance!